A Pioneer in the Online-Only Mattress Space, PlushBeds.com has Introduced an Exciting New Luxury Latex Mattress at an Attractive Price Point; Tailored Specifically for Side Sleepers and Couples, and Just in Time for its Annual Memorial Day Sale, starting May 26th. 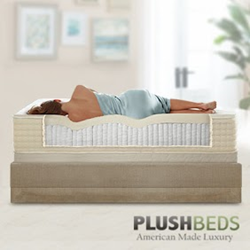 Just in time for the company’s Memorial Day Weekend sale, online luxury sleep brand, PlushBeds.com, has introduced an attractive new luxury natural mattress to its well-established product lineup. The 12” Luxury Bliss is a motion-isolating fabric-encased coil system designed with plush natural latex encased in an organic cotton cover.